Realizing that you’ve waited too long to apply for a passport is like being stuck in a bad dream. Terror and chagrin slowly mount as you realize the magnitude of your error. Unfortunately, since it’s not a dream, you can’t wake up. Good news: there’s no need to panic! Yes, the passport application process usually takes weeks, but there are ways to order a passport at the last minute. One way to get a passport quickly is to apply at a regional passport agency office. These agencies are operated by the Department of State and issue passports on site. Processing time varies depending on which agency you go to. However, they will generally get your passport to you within 24 hours to 5 business days, depending on when your departure date is. Now, here’s the catch: you can’t just walk in to a regional passport agency whenever you feel like it. These offices are open by appointment only, and they have limited operating hours as well. Much like a doctor’s office, just getting an appointment doesn’t mean that you’ll be seen at that time. You still have to take a number and wait in line. Also, the passport agencies are only in major cities. That means you might not even have one in your state, so you’ll have to budget travel time and expenses in as well as time off work. To use a passport agency, just call the National Passport Information Center to find the nearest location and make an appointment. To qualify for an appointment at most passport agencies, you must have a confirmed travel itinerary that takes you out of the country within the next 14 days. If you also need to get a visa for your destination, you become eligible for a passport agency appointment within 4 weeks of your departure date. Be on time… if you’re more than 15 minutes late to your appointment you’ll have to make another one. Bring all of the documents you’d normally need to apply for your passport or passport renewal as well as a copy of your itinerary to prove your eligibility. Less hassle: They deal with the State Department for you, so there’s no need for you to make an appointment or wait in line. No need to take time off work or spend gas money to get to a passport agency. When you use RushMyPassport, you get the benefit of an experienced guide to walk you through the application process and a handy, easy-to-follow checklist showing all of the documents you need. Applying for a passport can be a confusing process, but using an expediting company simplifies the procedure and reduces the chance of mistakes. You get your passport fast! If you are applying for your first passport or are otherwise required to turn in your application in person, you can still use an expediting company. You’ll just go in to a post office or other passport acceptance facility with your new passport photo and all of the necessary paperwork, and have your documents “sealed” by the passport acceptance agent. Then, you send them in to the expediting company, and the company will hand-deliver them to the Department of State for priority processing, often in as little as 24 hours. 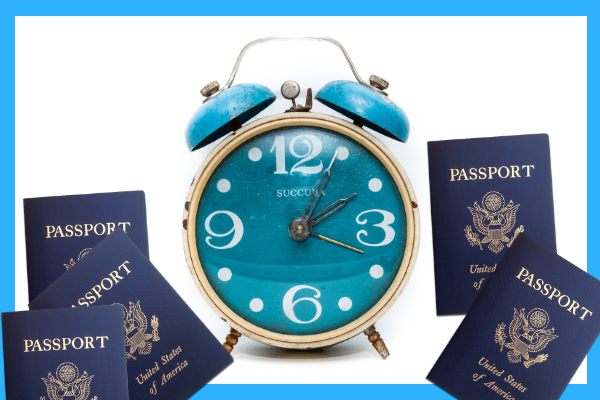 Need to order a passport at the last minute? Contact us today! I've heard that if you owe child support that you can't apply or if you do apply and owe to much,they keep your money that you sent in with your application. What is the amount that if you are behind they wont approve you for your passport. If I get on a cruise to the Bahamas And the only thing required is a drivers liscence and birth certificate. What happens if we get stuck andwe have to fly home and we don't have a passport?